The Child Development Centre (CDC) has launched its first mobile app for parents to track their child’s goals! The mobile app; “CDC Connects”, sponsored by FWD Hong Kong, will make it easier for parents to book appointments for Parent Reviews and be notified of all the latest news and announcements relevant to their child’s programme or individual session. 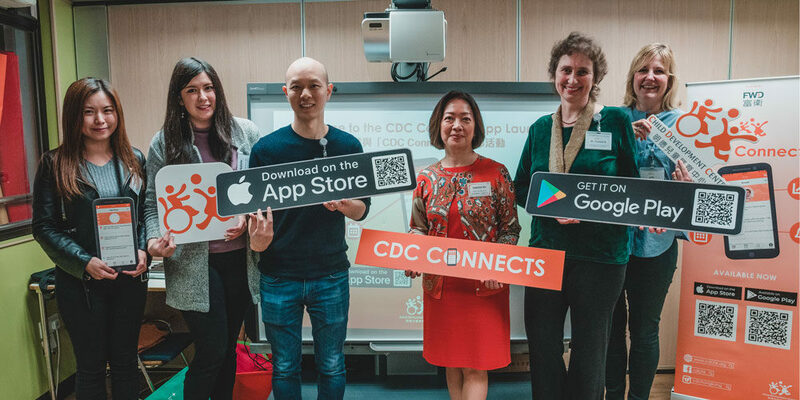 The CDC app launch event was held successfully on 12th March 2019. We were delighted to have our Chairman, Sabrina Ho, FWD and HealthMutual Group (HMG) representatives and CDC parents join the launch alongside a relaxed wine-and-cheese gathering with our teachers and therapists. During the event, there was a presentation for parents to learn about the features of the app. “We are so happy and excited to launch the app. We believe the app allows parents to fully understand their child’s learning progress at the CDC and at home.” says Dr. Yvonne Becher, Chief Executive of the CDC. Going forward, all assessment reports will be uploaded to the app and parents will also be able to view their child’s Individual Learning Pathway (ILP) goals with visual illustrations, where applicable. This will help them to practise their child’s goals at home. “CDC Connects” is now available on the Apple App Store iOS and Google Play Store Android.